Before Benoit Mandelbrot’s fractal mathematics and Gertrude Stein’s roses, Johann Wolfgang von Goethe wrote about a primal plant, “Urpflanze,” which was constructed as a leaf within a leaf within a leaf. 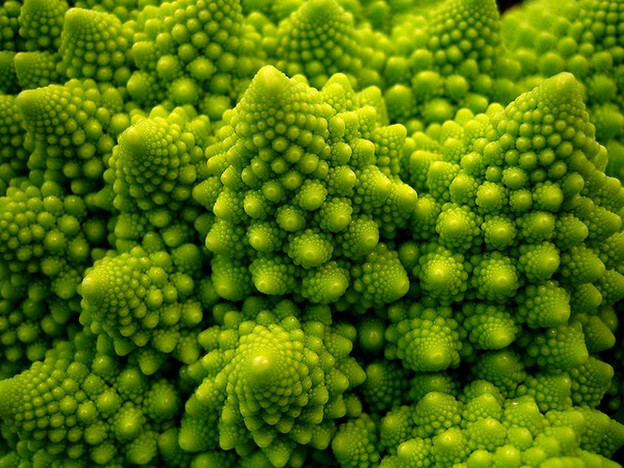 I wonder if his Platonic vision for this plant, from which all other plants derived, was an early imagining of fractal mathematics and response to fractal forms in the natural world (coast lines, human migration patterns, Romanesco broccoli). Visual depictions of fractals have no beginnings or endings in time, no inside or outside in space, and self-similarity and repetition occur at all discernible scales. To my eye, these aspects of visual fractals are pleasing. I am also dissatisfied by the undeviating periodicity of fractals. Despite an idyllic peak-n-valley and never-ending nowhere-everywhere, and unlike some poems and subatomic particles, in fractal video art that mesmerizingly moves the eyespot through fractal terrain, I can tell where I the eyespot am, where I the eyespot am going, and where I the eyespot has been. Fractals, while on the surface psychedelic, do not quantum jump. There is no dark matter. Fractals are like lite matter. Everything is seen. Fulton discusses the recursiveness of fractals as “revising hierarchical relations to suggest new dimensions of figure and ground” in poetry and beyond. It is an exciting idea and, while I disagree with other parts of Fulton’s essay, including her statements about the purpose of poetry, how she characterizes structure and truth, and the lessons of science and poetry, her notion that the recursiveness of fractals, like free verse, revises hierarchical relations suggests that poetry is an epistemic practice informed by mathematical fractional dimensions. Heisenberg’s uncertainty principle challenged the Cartesian split between agent and object by suggesting that the observer does not have total control of matter: the world bites back. ‘Neither does the object have total agency, whispering its secrets, mostly through the language of mathematics, into the ear of the attentive scientist’, Barad writes. ‘Knowledge is not so innocent’. Thus ‘nature is neither a blank slate for the free play of social inscriptions, nor some immediately present, transparently given “thingness”.’ Nature is slippery: a neither/nor. Light cannot be both particle and wave. Yet it is. The two categories dismantle one another, ‘exposing the limitations of the classical framework … Science is not the product of interaction between two well-differentiated entities: nature and culture.’ Rather, ‘it flies in the face of any matter-meaning dichotomy’. As Barad sees it, subjects and objects both have agency without having the ‘utopian symmetrical wholesome dialogue, outside of human representation’ posited by objectivist accounts. She proposes ‘not some holistic approach in which subject and object reunite … but a theory which insists on the importance of constructed boundaries and also the necessity of interrogating and refiguring them.’ Her theory of agential realism calls for ‘knowledges that reject transcendental, universal, unifying master theories in favor of understandings that are embodied and contextual’. The work of feminist scientists and philosophers (such as Sandra Harding, Donna Haraway and Karen Barad) critiques the authority of science, which—like every powerful belief system—needs such self-scrutiny lest it become smug and claustrophobic. Of course, the categories unsettled have enormous real world consequences. The old association of women with nature and men with culture undermined women as artists, thinkers, and human beings. Binary constructions of reality, unchecked by s[k]epticism, have a pervasive, destructive magnitude. When one considers their effects, it’s evident that the questions posed are ones literature needs to address until the world is just—which is to say, forevermore. It is through Alice Fulton’s fractal poetics that I have been thinking about the work of Abigail Child, poet, filmmaker, and cultural provocateur. I met Child during her recent visit to Wake Forest University as a guest in Lynn Book’s Visionary Speakers Series. In many of Child’s films such as Mirror World (2006), and in her new feature, UNBOUND: Scenes from the Life of Mary Shelley, where Child, during her time at the American Academy in Rome, made fake home movies of Mary Shelley, fractal mirroring often serves as the dominant visual yet is reconfigured over and over in intoxicating variation. Her poetry, on the other hand, reads intentionally anti-fractal, almost never self-similarly repeating but instead relentlessly stylized with variation. I wonder if Child’s work as a poet and filmmaker functions as a site of local connectivity where fractal forms fluidly ebb and flow and yet reconfigure in the visual work and, especially in the literary work, multiversally vary as if in a state of perpetual quantum jump. Does Child’s film and literary work represent a kind of union between fractal poetics, where repeating forms and self-similarity are at play, and quantum poetics, where uncertainty and unpredictable movements by quantum jump are enacted? If we find that audiences remain uncomfortable with abstraction, uncertainty, multiple positionality, and lack of closure—one hundred years after the discoveries of the theory of relativity and Heisenberg’s uncertainty principle—clearly the artist’s job at the beginning of a new century remains unfinished. This point by Child and Waldrop can be used to argue for the continued relevance of abstraction, uncertainty, multiple positionality, and lack of closure in literature and art within this contemporary moment where breakthroughs in science of the last and current century are too often ignored by writers and artists. Similarly, this point can be used to argue for the continued relevance of abstraction, uncertainty, multiple positionality, and lack of closure in this contemporary moment that, at times, prizes conceptual approaches to art and literature and, in other contexts, rejects these approaches as theoretically weak, ethically compromised, dogmatic in attempts at being a universal theory (reminiscent of Fulton saying that Barad challenges patriarchy in rejecting transcendental, universal theories in favor of contextual and embodied approaches), or simply passé. To my mind, while audiences and readers are more accepting of abstraction, uncertainty, multiple positionality, and lack of closure now than in the past, there still seems to be a lack of awareness as to how these modes are in conversation with the breakthroughs in physics over the last hundred years, breakthroughs that, should more people seek to investigate them, will make both individual and collective consensus reality more complex and, in turn, our poetry.